Velotio has helped many SaaS companies to engineer better B2B enterprise products. We architect cloud native applications and DevOps processes using modern technologies like micro-services, containers and serverless to enable continuous integration, continuous delivery and agile infrastructure. Prototyping, designing, product development and QA services for startups with aligned benefits. We have worked with startups as they scale from an idea to a validated funded business. We help companies to deliver software with increased agility by consulting and implementing continuous integration, continuous delivery and agile infrastructure. 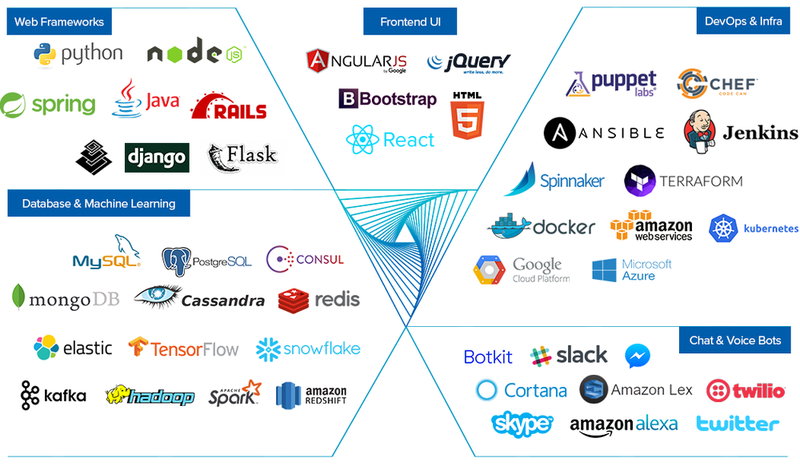 Helping enterprises and ISVs to build new cloud native applications and modernize legacy applications and infrastructure with cloud native, micro-services, containers & serverless. Partnering with AI & ML-based product companies for core development and QA. We also build intelligent applications using machine learning libraries and cloud services. Extensive Domain Expertise. Proven Team. Guaranteed Results. There’s a bot for everyone! "Velotio has world-class DevOps capabilities. Their architects have a deep understanding of the processes and tools required for setting up agile infrastructure and continuous delivery." "Velotio was hired to build our enterprise Salesforce Application. The deliverables were of high quality and it felt like we were working with colleagues rather than an offshore team." "Velotio was phenomenal to work with. They were quick to grasp our problems and design solutions. The quality of code, documentation, and clarity they bring is unparalleled." Sign up with your email address to receive our latest blogs delivered to your inbox.